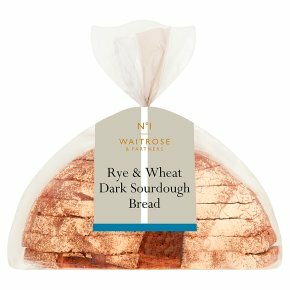 Handcrafted over three days with slow -fermented dough made from Shipton Mill flours and dark molasses,for rich rye flavour. A flour mill has stood on the site of Shipton Mill in the Cotswold since the time of the Domesday book.Today, the Shipton Mill Company makes a variety of speciality flours at their two mills,using both traditional grinding stones,and more modern methods. INGREDIENTS: Rye flour, water, fortified wheat flour (wheat flour, calcium carbonate, iron, niacin, thiamin), molasses, salt. For allergens, including cereals containing gluten, see ingredients in bold. May contain: peanuts, nuts and sesame.